Yea, slipped my mind I guess. We've been more miss than hit with Catholic league guys lately though. Before Gibbs it had been a while. 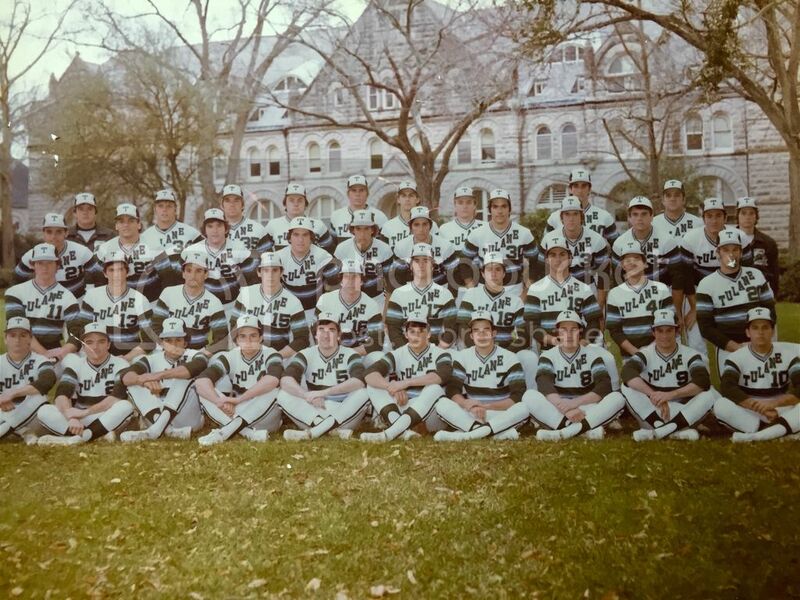 RobertM320 wrote: Man, when I was in school in the late 70's, almost the entire team was Catholic League. tps remembers. Francingues, Stokes, Hrapmann, Melito, Retif, etc. Jesuit: Mickey and Kenny Retif, Brian Butera, Drew Lukinovich, Donald Claire, Billy Gaudet, Billy Babin, Mike Riley, Paul Spansel and myself. Brother Martin: Barry Hebert, Pascal Calogero, Mike Rowe. Holy Cross: Billy Hrapmann,and Mark Mayer. Rummel: Kenny Francingues, Chuck Melito, David Stokes, Robert Fielder. DeLaSalle: Neil Comarda, Larry Cabacieras, Frank Wills. I may have left out a guy or two. That's 23 Catholic League players on the roster at one time. We probably haven't had 23 Catholic League players on the team in total since what, 2000? Has it even been that many? RobertM320 wrote: That's 23 Catholic League players on the roster at one time. We probably haven't had 23 Catholic League players on the team in total since what, 2000? Has it even been that many? It was always a lot back then. The Tulane recruiting budgets then were $0. Coach Brock was part time. He taught at EJ HS on the side. Coach Brock would drive out to the Catholic League games and sign kids from there. No national recruiting budget like today. Plus I'd say out of those 23 guys 90% had Legislative Scholarships or other aid. Tuition was only $3K a year. But Louisiana baseball was as good as it got. Many Catholic teams won American Legion World Series back then. Frank Wills had a long major league career. I knew Frank well. Had some classes together and he lived out near me in Destrehan for awhile. He passed away a while back if I remember correctly. Don't forget, I went to Rummel so I knew all these guys as well. Rummel's Legion team for many years was Schaff Brothers. They made it to the World Series a couple of times and I think the won it one year. RobertM320 wrote: I knew Frank well. Had some classes together and he lived out near me in Destrehan for awhile. He passed away a while back if I remember correctly. Frank was one of my best friends on the team and we stayed friends until his death. We both competed in HS and had classes together at Tulane. He passed away in Nov 2014. Frank was always a competitor in everything he did. It was great competing with him in high school (Jesuit vs De La Salle) but it was even better being a teammate with him in college. One story I'll never forget took place our freshman year at Tulane. Frank and I had a few classes together and quite often during football season he would have to miss class due to the team playing out of town. When Frank returned he would want to get a copy of my notes. As usual we would meet up in the Tulane library at the first floor copy machine. This one day in particular was exam week and it was so quiet you could hear a pin drop. I passed my notebook over to Frank. The first page came out very light and was difficult to read. So Frank figured if he'd put some pressure on the notebook the next copy would come out darker. Before I knew what happened, I heard a loud noise and the sound of glass breaking. I looked over to the copy machine and Frank had pressed down so hard that he had broken through the glass all the way down to the lens. He had cut his right hand pretty bad. Frank and I both looked at each other red-faced. By this time a group of people had come around to see what had happened. Frank then turns to me and says, "Tim, thank god it's not baseball season". Thanks for the memories Frank. My thoughts and prayers go out to you and your family. Just realized someone else we left out of that list. Billy Kampen from Rummel. RobertM320 wrote: Just realized someone else we left out of that list. Billy Kampen from Rummel. Thanks for the update. Promising. Great! Who are Acy Owens and who is David Bedgood? It would help those of us that don't follow recruiting day to day if you could say "Tulane Football recruit" or "Tulane basketball recruit" or even give their positions. If these two were mentioned earlier in this thread, it's likely been days since most of us remember who they are. And if they get drafted (assuming they're baseball players) and don't come to Tulane, years from now someone scrolling through this thread will have no clue as to why this was posted. Last edited by DfromCT on Tue May 09, 2017 7:37 am, edited 2 times in total. Great! Who is Acy Owens? Awesome. We need depth at catcher. Gozzo will be a true Sophomore next year, but he's our only catcher, unless they give Montalbano a medical RS. Thanks for clarifying! We have a few Frosh that haven't played much, if at all this season. Does anyone close to the program know if they (Abdalla, Price, Schnake, Gillies, et al.) are redshirting, or injured, or possibly transferring out? THANKS! Last edited by DfromCT on Tue May 09, 2017 7:47 am, edited 1 time in total. Bedgood has a younger brother that had a pretty impressive Freshman season on the same team. Their coach is practically begging someone to pick up uncommitted, 2017 OF Seth Martin. He's got some pop off the bat, and the coach thinks he's a great kid. Do we have Josh Bates committed? If not, maybe a coach could scout both next time Bates pitches.